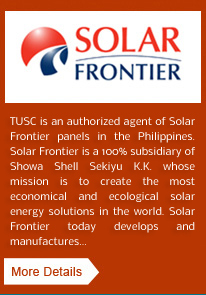 Transnational Uyeno Solar Corporation (TUSC) is engaged in solar power generation and systems integration. Its mission is to provide clean power and build a sustainable, clean and green world by promoting the widespread adoption of solar energy. With a diverse portfolio of solar installations in the Philippines, TUSC is one of the leading solar energy companies in the country. 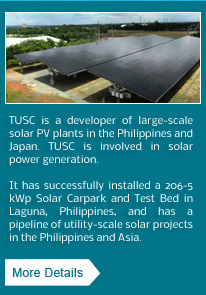 TUSC has distinguished itself as one of the pioneers in solar power generation in the country, building the first-ever solar photovoltaic (PV) carpark in the Philippines without any government subsidies. This milestone project has given the company firsthand experience in the development, construction, operations and maintenance of a solar PV plant, and has provided critical information on the performance of different solar technologies under Philippine conditions. 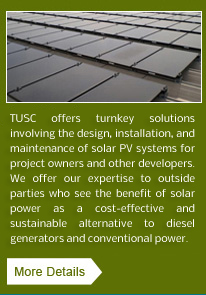 TUSC is a joint venture between two strong, stable and forward-thinking organizations: Philippine-based Transnational Renewable Energy Corporation (TREC), and Japan-based Uyeno Green Solutions Ltd. (UGS). TREC is a proud member of the Transnational Diversified Group of Companies, a strong Philippine-based business group of more than 30 dynamic member companies that are major players in diverse industries such as shipping, logistics, ship management, education, air and travel, business process outsourcing, information and communications technology, and others. A fully owned subsidiary of TDG, TREC is engaged in the research, exploration, generation, development and production of renewable energy, with investments in various wind and solar energy projects in the Philippines. The Uyeno Group is Japan’s second largest domestic petroleum logistics company and the only company that offers end-to-end solutions for the petrochemical industry. UGS provides logistics and distribution services for solar panels and is a certified solar systems integrator with a large portfolio of solar installations and megasolar investments in Japan.